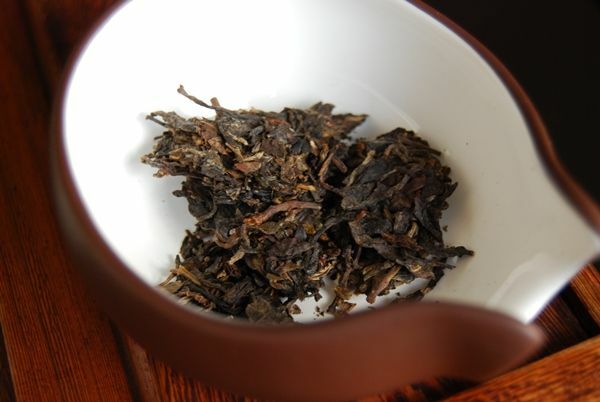 The Half-Dipper: 2007 Menghai Foyuan "Yexiangwang"
Why oh why am I wasting your time with this wackiness? What could possibly be the reason for detaining you? Have I finally gone (more) stark, raving bonkers? Ye gods, what manner of tomfoolery is this? The game's definitely afoot, because this cake is a complete surprise. Let me tell you the whole story. The web-site for twodog2's new venture is uncluttered and offers decent data for each cake. Perhaps better yet, the repertoire of cakes centres around those that twodog2 has enjoyed during his wanderings (in Beijing, by the look of the cakes). He is apparently aiming to hit that "sweet spot" between low-quality filler and unfathomably-expensive boutique cakes, which is an area that I'd like to see more developed by Western-oriented pu'ercha merchants. This Wild Elephant King cake (I snigger just writing it) is really rather good. Twodog2 notes that this is a "tiepai" [teeyeah-pie, "pasted brand"] cake, which means that it has been wrapped in someone else's wrappers. We couldn't quite ascertain if this is originally a "Yexiangwang" cake which was originally intended to fake something else, or whether someone took the bizarre step of intending to fake Yexiangwang. If you were going to fake something, surely you wouldn't bother faking a bottom-of-the-list cake from a minor factory. The cake also claimed to be from 2006, but it is 2007. As I wrote above, it sells around the Sinosphere for around 200 RMB, and so twodog2's price of $31 is entirely reasonable. Given the actual quality of the cake, I have to state as objectively as possible that it is rather a barg. If there's one thing pu'ercha drinkers like more than anything else, it's an inexpensive cake (possibly even a dodgy "fake") that actually turns out to be darned good. The bargain sensors are lighting up. Let's get down to zinc-copper alloyed tacks. Denuding the cake of its potentially misleading wrapper, we can see that this is something of an "old fashioned" cake, to put it kindly. 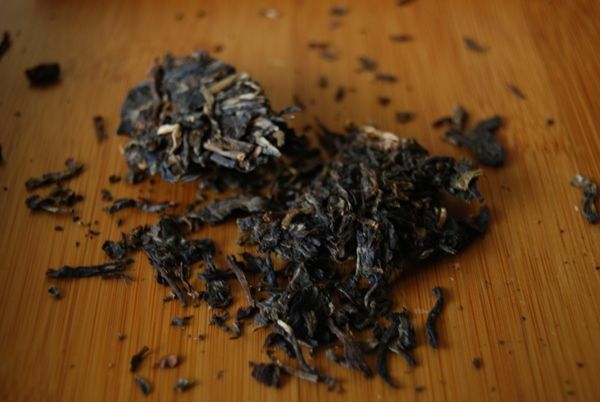 By which, I mean that it looks rough: the leaves are heavily fragmented, there are plenty of hefty stems, and it has everything chucked in that could possibly come from the pu'er tree, including huangpian [yellow flakes, usually removed]. Perversely, this sheer nastiness of appearance actually commends itself to me, because these "robust" mixtures can turn out to be rather decent. They usually have something to say, at least. The aroma in this case is of a charming, flinty sweetness. "This has the opportunity to be rather special", I seem to have put down in my journal. And rather special it is, when set against the context of its background. It is clean and exceptionally cooling. It has just the right amount of aggression in its finish, and it has a stable, metallic centre of high-density sweetness. Its "old fashioned" appearance follows through into the character in the cup: this tastes like old-recipe pu'ercha, but young. 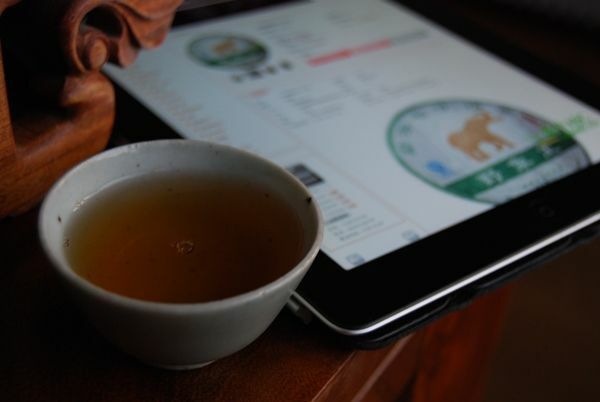 The heaviness of the sweetness and the long-lasting potency (both during a single infusion, and across multiple infusions) are both good indicators that it may not fade away, but may instead build into something quite decent. "You should buy some - it's rather good", notes my dear wife. Needless to say, the wifely recommendation is seldom heard, and I get onto teadog2 straight away to ensure my tong is safe. If you like "classic" style cakes, with the metallic sweetness of, for example, the 2006 Changdahao cakes (which I love bigtime), then you might very well enjoy this sweet little cake. It is a complete bargain, after all. P.s. 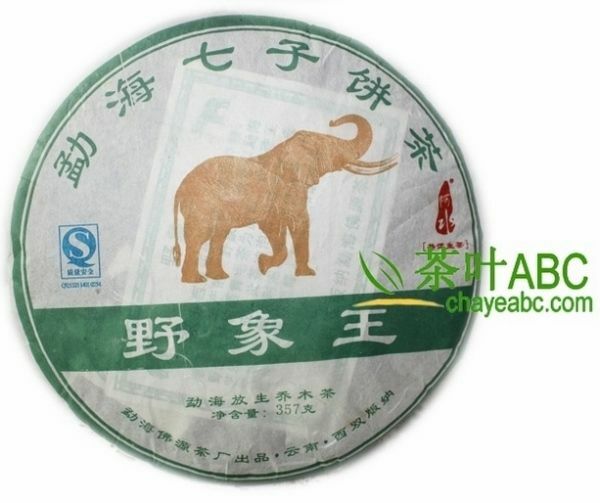 Yexianggu [Wild Elephant Valley] is a region in Xishuangbanna, although this cake is made from (at least in part) leaves from Nakashan. It tastes properly 'Banna-like. P.p.s. "Foyuan" means "Buddha source", more or less. It can mean the same in Zen as a euphemism for Big Mind, etc. The site where you got the picture, chayeabc, is full of dodgy cakes. By the way, I believe it's Foyuan? Glad you enjoyed this one! 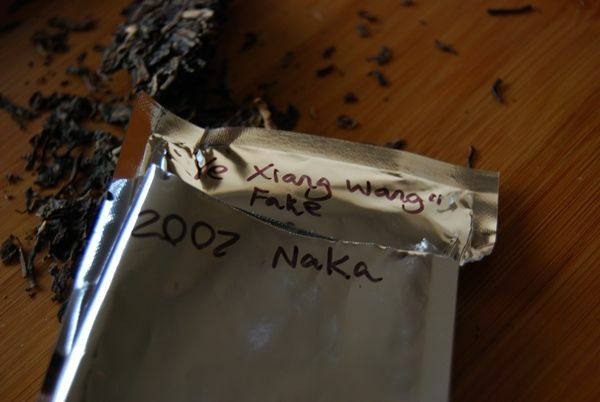 It has made frequent appearances in my daily puer rotation during the last year. Nice indeed ! Thanks for the tip. My shipment arrived (midwest USA) 10 days after ordering. Thanks Twodog2. 'twas reading the old teachat taobao thread and noticed twodog2's remark on his $3 taobao Naka cake purchase. I'm wondering now if this cake being offered at $30+ could be the same one ? I'm afraid I haven't come across this thread and so wouldn't like to comment. I'm fairly sure I recall that twodog2 bought this from our mutual buddy in Maliandao, however, and so would imagine that it's not the same cake. That cake was a different cake, listed as "2012 Spring Naka", but probably more like 2011 Summer Whoknows. I forgot what teachat thread I mentioned it in, but I never got around to doing a blog post on it - I will now though! I'm drinking a sample of this now. Good decision getting a tong. The price has (naturally) gone up in the two years since this review. The cha qi hit me like a truck. Definitely not something I was expecting. I'm now deciding if I want a cake, or a tong. Ohhh, it's good. The Elephant. The pachyderm never forgets!